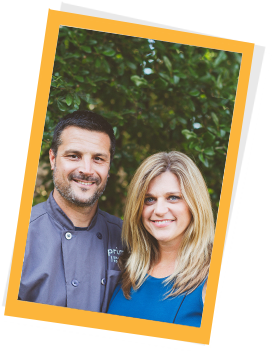 When my wife Lisa and I started our restaurant and catering business, culinary creativity and the passion for all foods that could be uniquely different in style, taste, texture and usability were our inspirations. This same culinary drive and spirit is how Primizie (Pri' mit tsje) Flatbread Crisps were created. The basis for our flatbread crisps was discovered in Italy while traveling on a culinary tour through the country. The bread recipe was re-developed and became the cornerstone to our menus for Neapolitan pizzas, paninis and antipasto platters. We discovered that when these breads were “crisped” they served as an even better vehicle for passed hors d’ Oeuvres, as bruschetta for antipasti and had superior “dipability” characteristics for cheeses and hearty dips. Primizie Flatbread Crisps became an instant favorite to all we served. Primizie Flatbread Crisps are a true chef created snack. They are an addictive, flavor forward, thick cut specialty chip with a distinctive crunch. Primizie Flatbread Crisps are great for snacking on their own or pair perfectly with just about any dip or spread imaginable. We hope you enjoy them as much as our family, friends and customers have over the years. Primizie sources the cleanest most wholesome All Natural ingredients we can find. We take special care in selecting our flours, herbs and spices to ensure the finest products reach you - our customer.